just a bit frayed: Geogram by Samarra Khaja! Blog tour stop #1! 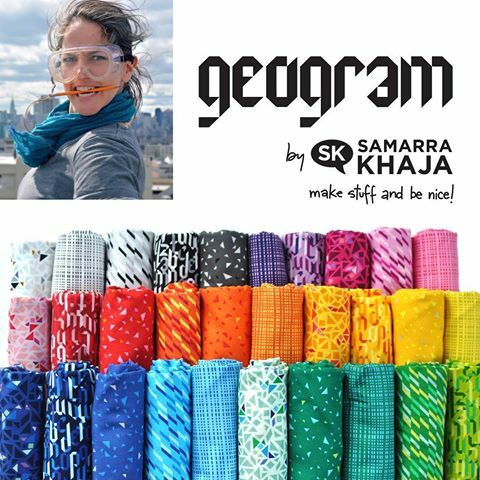 Geogram by Samarra Khaja! Blog tour stop #1! First, here's a photo of Samarra and the pretty rainbow of fabrics that she created! While this alone is most likely enough to get you to run out and BUY this fabric, I suppose I could show you a project made with it too. You know, to really seal the deal. When I was asked if I wanted to make something with a charm pack of Geogram, I immediately said, "yes!" I had this idea that I was thinking about using machine applique and orange peels and this line would work perfectly! I had originally thought about making this into a baby quilt, but I have no babies. I do have this huge floor pillow that needs a cover. My son has a new habit of reading or playing Minecraft on the iPad in the middle of the floor on one of the small couch cushions. This, I think will be much more comfortable for him. Last Quilt Market, I just happened to sit next to Sue Pelland and lunch. 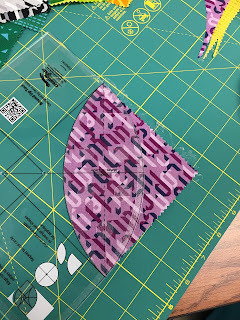 I have been thinking a lot about machine applique and learning everything that I can about it to step up my game. 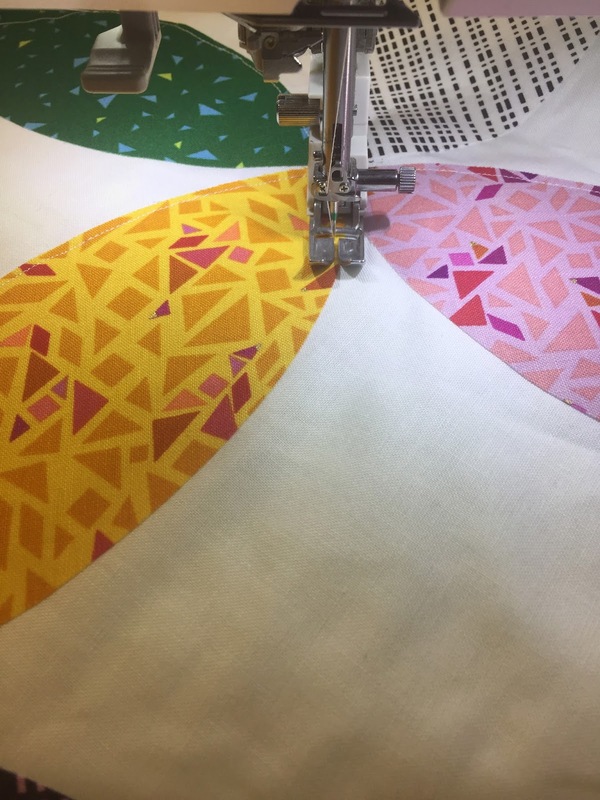 What a crazy coincidence that she's like the machine applique queen. (Seriously, her rulers are genius!) One of the things I don't love with applique is the stiff look you get with most fusables like Wonder Under. But you need something to glue the fabric down. Sue had mentioned to me to try out Mistyfuse. It all looks very confusing. There's no paper. So how do you iron it? Well, you have to have a Goddess Sheet. Okay, that sounds confusing but it's really not. I watched a YouTube video and it took me about 15 minutes to figure it out. I had some Mistyfuse, my Goddess Sheet, a handy new Creative Grids Round Up Tool (which also has a great video tutorial) and a charm pack of Geogram. I set to work making some orange peels with the Mistyfuse attached to the back. This stuff is really nice. It's soft and flexible even with the glue on the back! I cut out way too many of the little orange peels but that's okay. I have enough for a second big floor pillow now. I want the edges to fray (just a bit!) over time and give the pillow a little texture and so I just sewed close to the edge of the orange peels. I did this with the batting behind it to kill two birds with one stone. After pressing the peels down, they stayed put really well and I just "quilted" them onto the pillow top! Done. I used SOTAK Handmade's zipper closure tutorial and then I had my pillow completed! It looks really cool with the Geogram doesn't it? I think the fabric looks great against the bright white. The pillow finishes at 24" x 24". Really big and fluffy for the floor. Before I let you go, I want to show you something. At Quilt Market, Samarra had this really awesome Home Sweet Home quilt hanging at the Lecien booth with her collection projects. The font matches the print in Geogram with the text on it. 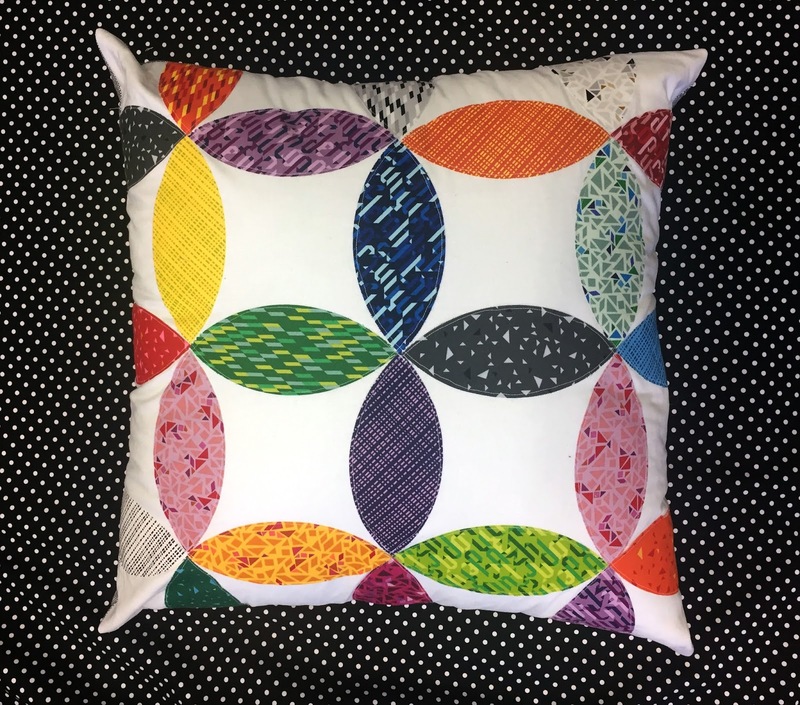 This is a FREE quilt pattern that Samarra has made, just for us! 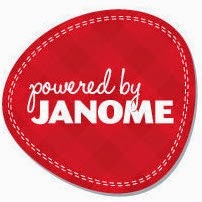 If you click on the photo it will take you to the free pattern! Thanks, I'd never heard of Misty Fuse or Goddess Sheet before now. I'll be sure by buy some soon. 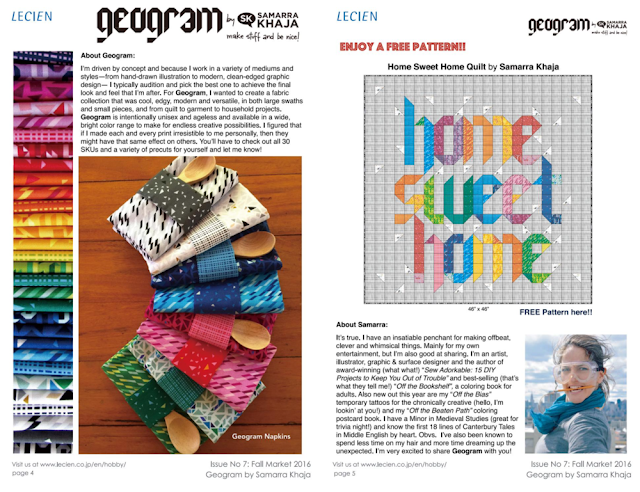 When will Geogram be in stock at Pink Castle Fabrics? This is too perfect! 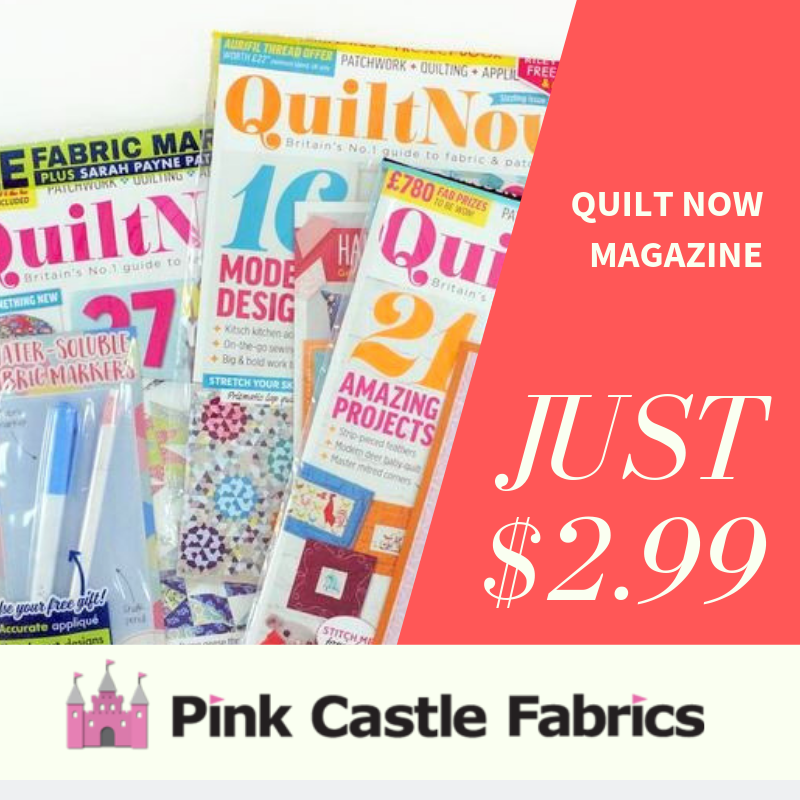 Love the colors and especially the quilting! So rad!